There really is no excuse not to whip up a quick dinner with this fajita recipe. Long gone are the days of using a jar of stir in sauce- this takes no time at all without compromising on flavour. I serve fajitas with guacamole and salsa as well as a liberal helping of soured cream so I have also given you recipes for this. Enjoy! 1. Start by marinating the chicken chunks. The marinade works just as well if you only leave it for a few minutes or if you leave it for longer. Put the chicken in a large bowl and add the paprika, cumin, oregano and chilli powder along with the juice of a lime and you can also add a little zest if you like. Set aside until you’re ready to use it. 2. Heat a splash of oil in a large frying pan and add the chicken for a couple of minutes just to get a bit of colour before adding the onion and peppers. Cook until the chicken is cooked through and the vegetables are softening. If you like your peppers a bit crunchier in your fajitas then simply add them in towards the end of cooking. 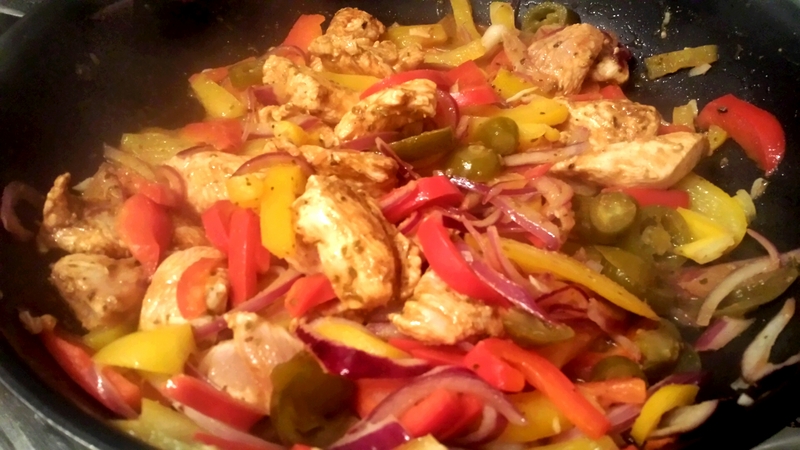 When the fajita mix is nearly ready, throw in the jalapenos and cook for a further minute or so. 1. Start off by preparing the tomatoes by making a small cross on the end of each and blanching them in hot water for 30 seconds. Remove and then peel the skin off. Of course you can leave the skin on too if you like a bit more texture. Scoop out the seeds and chop finely. 2. Next up sort out the avocados by halving, removing the stone and scooping out the flesh. Use the back of a fork and mash until it reaches a smooth consistency before adding in the lime juice. 3. Take the onion, garlic, coriander and chilli and stir through the avocado to combine before adding the tomato. Check the seasoning and adjust to taste. 1. Step one: combine all the ingredients and serve! It could not be easier!